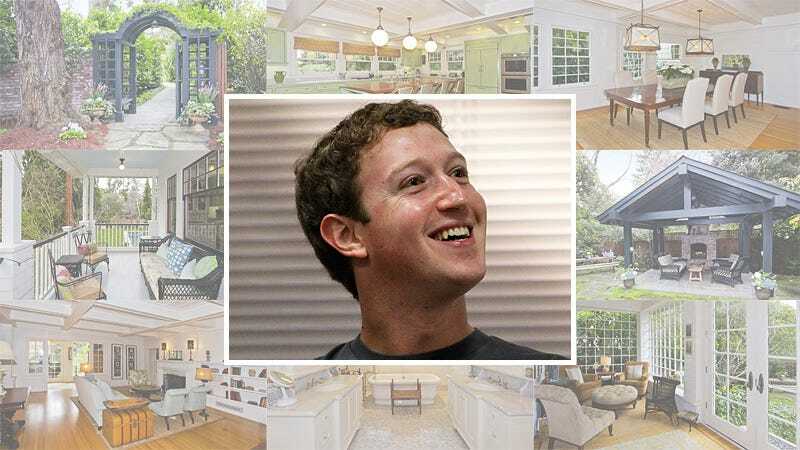 Click the gallery above to tour Zuckerberg's bathroom, complete with heated floors and a romantic marble deep soaking tub; the "croquet-worthy level lawn;" the outdoor entertainment pavilion with fireplace, barbecue, spa and pool; a kitchen with a breakfast bar and cherry-wood island; an "east coast style" sun room, as the agent put it (Zuck and girlfriend Priscilla Chan must miss Harvard); and the dramatically old school living room. It's an elegant house, albeit one that wouldn't fetch anywhere near $7 million in most other parts of the country. With the expansive outside hangout spots and numerous bodies of water to jump into, it also promises to be a launch pad for some killer parties among Facebook's young engineers, as antisocial as the perimeter walls, trees and privacy shrubs we referred to in our previous post might sound. We can't help but wish the sellers had snapped a picture of the "naturalized pond with waterfall;" the computerized portion of the kitchen; or the master bathroom's "enclosed commode with skylight." We're also not sure the place is quite as "sprawling" and "opulent" as the marketing materials may suggest, but then again Zuck paid well over the $5.9 million asking price, so the hype paid off. And give the agent credit for including one unflattering detail in the sales materials: The first rich guy to buy the mansion, sometime state senator, real estate investor and Stanford graduate Marshall Black, "was imprisoned for three years for embezzlement from the loan association" of Palo Alto back in 1913. Oh, my. Hopefully Zuckerberg won't have quite so much trouble with the law (although you never know, really, with these hyperambitious Valley types).